So here she is, my latest furniture transformation at long last complete! I started this vintage dresser several months ago when I was in the process of testing three homemade chalkpaint recipes. You can read my review here to find out the one I rated as the BEST! Anyway . . . this is how she looked before. The dresser came with a marble top but I’ve left it off for now as I have other plans for it. The marble was covering up some damage to the wood veneer top so I scraped away loose wood, sanded and filled with Wood Filler, sanded again and started painting. The top isn’t perfect, it has some little dings and divets (just like me!) to give it the character that comes with age, but it looks pretty good with a few coats of paint . . .
. . . and a little Annie Sloan Soft Wax buffed to a soft shine. I added stripes to the sides for visual interest and to modernize this piece a bit. I held onto the original wood knobs for a future project and purchased glass knobs from World Market. I also purchased this floral applique from an Etsy shop online, then painted and antiqued it. Here are some close-ups of a light distressing I gave the piece. I will be selling this and I’ve found that some people don’t like much distressing. I can always add to the effect later for anyone who prefers more. Next is the special surprise when the drawers are opened! The wood in the bottoms of the drawers was a bit rippled, like there had been some water damage. They were still solid though so I decided to do a little decoupage to hide the roughness. I got the graphics (old postcards, French script and vintage ladies) from The Graphics Fairy. I then painted the insides of the drawers with a third paint color. Here’s a closer look at the lovely ladies. That little tutu is my favorite color! The three colors used on this dresser are: Behr Dream Catcher & Myth on the outside & Prelude for the insides of the drawers. One last surprise is a peek at the back of the dresser. I painted it rather than leave it unfinished so it doesn’t necessarily have to stay up against a wall. This little gal is a wallflower no longer! I hope you enjoyed seeing another OLD THING made NEW. I sure enjoyed sharing it with you. By the way, what do you think of stripes? I’m thinking of adding some to my walls. « $1000 Visa Gift Card Giveaway!!! Your dresser and mirror are absolutely beautiful. I dream of painting at your level some day. Thank you Carol and bless you for your kind words! I don’t really think of myself as being at a very high “level” yet. Chalk paint is just so easy to work with. Big hugs to you. your dresser turned out fabulous, very unique piece! Wow Lauren, that means a lot to me because ALL of your furniture re-do’s are magnificent. Thank you! The details you put into this piece is just brilliant. The stripes are indeed a visual interest. Thank you so much Kay. I don’t know about brilliant, hahaha, maybe inspired from above! Hugs to you. Beautiful! I can tell you put a lot of effort into this. Love the colour combination you chose! Oh thank you Cynthia. It was totally worth the effort and I didn’t have to change the color as I have on some of the other pieces I’ve done. What luck! 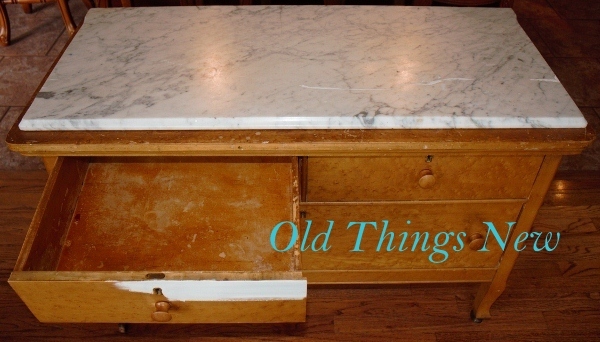 What a fantastic piece – love what you did on the inside of the drawers! Someone with the name Whimsey Creations would enjoy the drawers! Thank you for visiting and your kind comment. This is gorgeous, admirable, wonderful. What a pity I can’t buy it.That makes me work even harder to finish my renovation. I hope I’ll be able to take some pictures soon. Oh Magdalena – I wish you could buy it too. I’ll look forward to seeing pics of your renovations. Oh my Goodness! This is one of the prettiest pieces I have ever seen, and it looks exactly like an Annie Sloan piece! You are good! I am in love with the colors! I love how you did the drawers and you even painted the back of it! Just simply beautiful! I will keep track of these colors, as I will do something similar!! Thank you for following me for the Grow Your Blog party! And so sorry it’s taken me this long to get back to you! I am now following you! Yay! So glad to be following each other! And thank you for all the praise for my little dressers. It is always so good to get feedback. Hugs to you too, P.
Thank you so much Taylor. I’m happy you found my blog & I’ll be heading over to take a look at yours too! P.
Thank you Lynne. The blog hop continues! Oh thank you Katarina. That is so sweet of you. Absolutely beautiful! Love all the little added details! Thank you for the compliment and the invite! I headed over to your blog and shared this post. Hugs to you, P.
Great job on this dresser, Patti! I love the colors you went with. The applique was a great touch. I love the stripes! I like to add them in myself sometimes on a piece of furniture. Sometimes it just needs a little something. You did a great job on this…love the color combo, and especially like the stripes. Nice to see an old piece brought back to life! Thanks Patti (with an “i” like me). I do love seeing old pieces given another chance. Glad you paid me a visit. Patti, The dresser is now adorable! I love the colors and the cute stripes…great job transforming this piece. Gorgeous!!!!!!! I love the striped sides! I’d love if you’d link this up to my link party going on now! We just started partyin’ and we’d love to have you! I feature my favorites each week! I headed right over and linked up. Thanks for the invite and for the compliment. XOXO to you! Great transformation! I love the dresser and the cute details in the drawers! It was such a fun surprise to see the stripes on the side of that formal dresser. Love that surprise!! Very cute! I love all the special touches you gave the piece! Great job! I love the stripes on the sides and the embellished drawers! Very creative! Thank you Elizabeth. So nice to have a friend like you to follow! Thank you Martina. I paid a visit to your blog. Great content! You did a great job. I particularly love the rose motif, and the back, what a good idea. Thanks so much Irene. Your comments are much appreciated. Wow! The color you chose is perfect and the lines on the side are a nice touch. My favorite part is how you lined the drawers. So nice of you to pay be a visit and thank you for the sweet comments. Blessings back to you! I love the dresser. It is gorgeous. You did an amazing job with the transformation. Really stunning! What a transformation! Thanks Stacey and a most blessed week to you too. I came over and I am following you back for sure (love your new his & her pillows)! I copied and pasted the link to your before vanity but it didn’t go anywhere when I pasted it into my browser 🙁 Maybe you could email me and add it as an attachment. I’d love to see your before and after. The dresser looks wonderful and I love the inside of the drawer. Love being featured by you! Thank you so much. 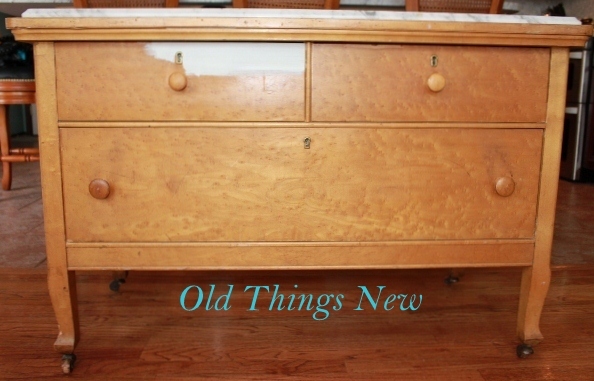 Oh my what a beautiful make over—inspires me to do the dressers in our bedroom–they are all different —original wood stains. Nice! Do try chalk paint. It is such an amazing medium to paint with. Thanks for coming by and leaving a comment. I’m so happy I found you while visiting another blog! I do love this dresser. I have been trying to decide what to do with a great dresser that I adore except the color. I’ve been told that it is a rare find and I should not paint it, but I have been looking for just this! Wow!!!! I’m gonna try. Hope you’ll visit and follow me. I will be catching up with you often! You did beautiful job! Every detail paid attention to. Love the surprise! Following now! The stripes are a perfect choice for this piece. Wonderful colors, too. Thanks for taking the time to stop by and for the nice comment Holly. Love the way that you gave it such a fresh and modern feel! The colors and embellishments are spot on! Your blog is amazing! I’m following to see what you create next! You are welcome to link any time. We’d love to have you! Love that dresser! Especially the stripes on the side. Just lovely, and lucky is the person to have it in their home! I’ll be following to see more of your creations! Hi Katie and thank you. I paid a visit to your blog and you do lovely furniture restorations. I especially love the cane chair. The fabric you used is great! I’ll be following you too! OH MY!!! What a gorgeous piece! I’m not normally a ‘gray’ person, but this piece just took my breath away! I love the detail of the painting the back, the new handles and detail on the drawer as well as the Victorian prints in the painted drawers! The stripes certainly gave it a more modern feel! She’s a gorgeous girl! I’m visiting from Liz Marie’s blog and will be following you. I’m not a blogger, but I am new to painting furniture, so I’m looking to all you experienced girls for ideas and advice! Awesome job, Patricia! So happy to have you as a new follower Camille! Thank you for your wonderful comments. They made my day. Hugs to you! Thank you so much Kathryn. I’ll be there! 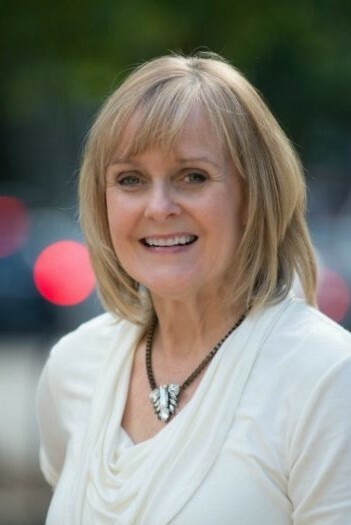 Patti, I wasn’t sure where to post this, so I’m doing it right here! 🙂 Thank you so much for featuring my blog as your favorite blog of the week! What an honor!! I think I will have to “copy” this look for a piece sometime in the near future–it is divine!! Thank you Lisa – Isn’t it great that we all have each other as inspiration & to “copy” from? We are changing the look of old furniture one piece at a time! A total beauty – inside, outside, front, back and sides – you’ve got it covered! Patricia, it is a real beauty! I am interested in seeing which method you liked best. Going to check out your post. So far I have used the real A.S. and the homemade with plaster of Paris. I really couldn’t tell much difference between the two. Homemade definately cheaper. I love the decoupaged drawers. I am workin on an old desk. Painted it white and sanded about the same as you did. I will add wax tomorrow. What do you use to buff yours? Mine doesn’t shine quite that much. Must need to buff it more. I am decoupaging the inside of the drawers with old book pages. Thanks for sharing with SYC. Hi Jann – I just used the blue shop rags from the hardware store because they don’t leave lint imbedded in the wax. I also used a lot of elbow grease. If you’ve buffed really well and there still isn’t a shine you might try adding another coat of wax and buffing again. Thanks for your comments. Hi Patricia, just hopping back to let you know that I am featuring you at Share Your Cup.